In third grade I learned that it is possible to fall in love with a book, but not until reading Winter World did I realize a book could make me — almost — like wasps. Heinrich is a biology professor who writes like a journalism professor. His seemingly obsessive curiosity takes him, literally, into beaver dams, bear caves, and active hornet nests, and he reports back with elegant descriptions, articulate phrasing, and often dismaying imagery. 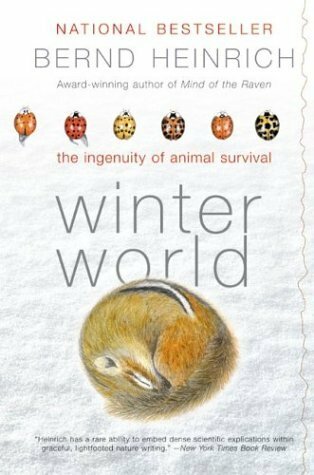 Winter World is every iota about survival, specifically us animals making it through the years’ cold, dry, wet, food-deprived, dark, predator-laden months. I began to wonder about all the things I am not seeing. Heinrich reminds us that creatures flourish beneath tree bark, in hidden nests constructed of moose hairs and grouse feathers, and inside goldenrod stems. A scientist, he counts, measures, and tears things apart. He stuffs seeds into the cheeks of a roadkill chipmunk to determine its food-storing capacity; he dissects dead honeybee rectums to see if part of the reason they leave their cozy hives in midwinter is because they have to go to the bathroom. He answers hundreds of questions I’ve had since I was that third grader; he leaves me wanting to ask him thousands more. The book’s tone flips back and forth between styles: Latin-name spewing, serious researcher and romantic poet. Just when I couldn’t process any more temperature-analysis data, the next page read like Thoreau enjoying a weeny roast. Winter World examines our challenging situation of staying alive and (often) well in the part of the year when resources and comfort are particularly scarce. Heinrich is a scientist, nature writer, and poet, and thinks like an economist.